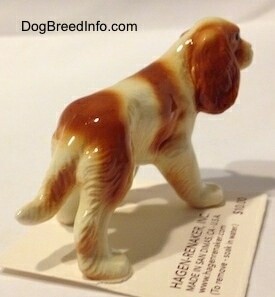 Pictured is a vintage Goebel double-crown mark Cavalier King Charles Spaniel. 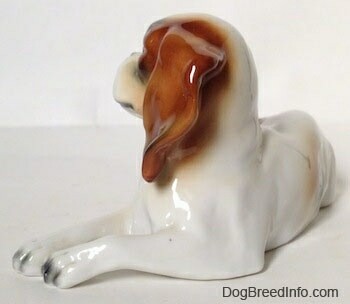 It is of a white dog with a brown mask face, brown ears and a brown and black patch on its back. It is in a lying down pose. The eyes are brown and black with white edges and the nose and mouth-line are black. The paws are white with black tips. On the bottom of the figurine is the crown mark logo, which appears twice. The crown mark is the very first trademark (TMK-1) the Goebel company used on their figurines. It was used between 1935 and 1949. It is the symbol of a crown; under the crown are the letters W and G overlapping one another. The term double-crown mark is used when the symbol appears twice on the same piece. On this figurine it appears in a blue stamp and an incised engraving. There is also an engraving that reads CH. 116. It measures 2 3/4 inches tall from the ground to the top of the head, 5 1/2 inches long from the base of the tail to the front paw and 2 1/2 inches wide from the back to the side of the tail. 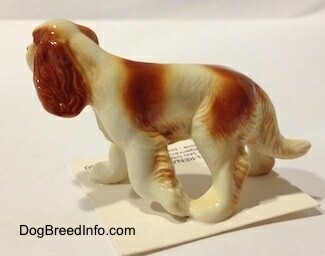 Vintage Goebel double-crown mark Cavalier King Charles Spaniel—image shows the two crown mark logos. The crown mark is the very first trademark (TMK-1) the Goebel company used on their figurines. It was used between 1935 and 1949. It is the symbol of a crown; under the crown are the letters W and G overlapping one another. The term double-crown mark is used when the symbol appears twice on the same piece. 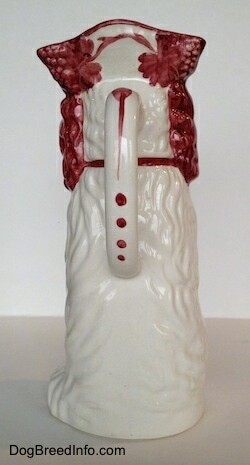 On this figurine it appears in a blue stamp and an incised engraving. There is also an engraving that reads CH. 116. 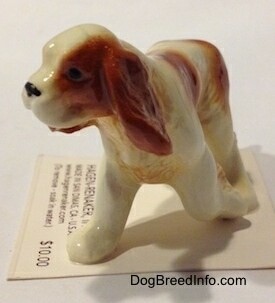 This is the Hagen-Renaker miniature dog called "King Charles Spaniel". 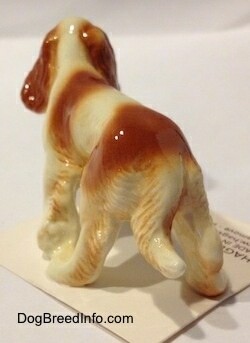 It is of a Cavalier King Charles Spaniel in a standing pose. 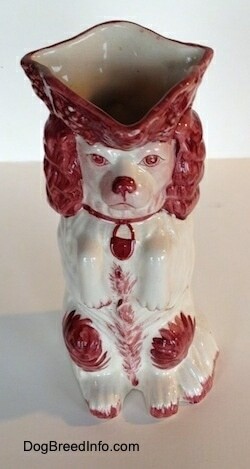 The company calls it a “King Charles Spaniel,” however that is actually a different breed than this figurine. 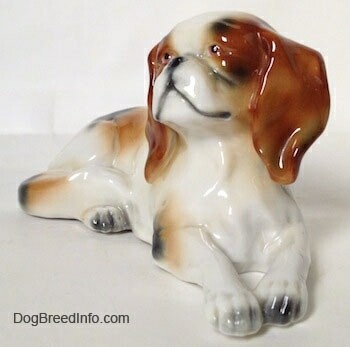 The King Charles Spaniel is another name for the English Toy Spaniel. The King Charles Spaniel (English Toy Spaniel) has a rounder, Pug-like face with a pushed back nose and extra skin under the eyes. 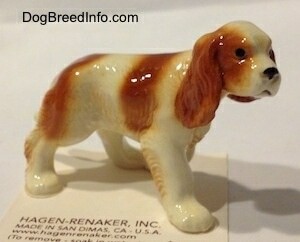 I suppose the company decided to shorten the name by taking off the word “Cavalier,” not realizing it changed the breed. 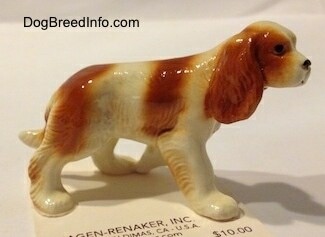 In any case, it is an adorable Blenheim-colored Cavalier King Charles Spaniel in a standing pose. 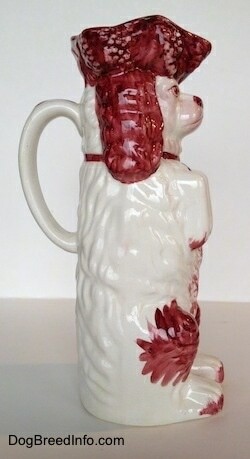 It was designed by artist Maureen Love Calvert. It is item number 3391 and was first put on the HR line in the fall of 2004. It measures 1 3/4 inch tall from the ground to the top of the head, 2 7/8 inch long from the tip of the tail to the tip of the nose and 1 1/4 inch wide across the front from paw to paw. Made in the USA. 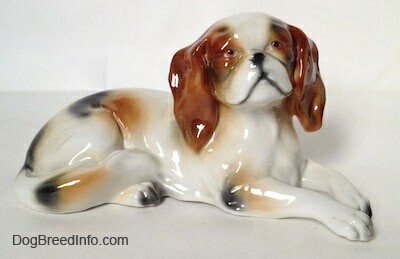 This is a vintage Cavalier King Charles Spaniel dog porcelain water pitcher. 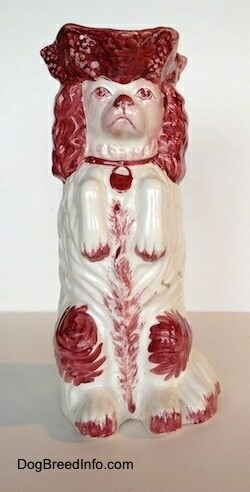 This is a white and maroon dog in a begging pose. 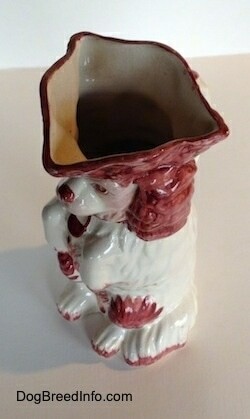 It stands 10 inches high from the ground to the top of the pitcher, 5 1/2 inches long from the front paws to the back handle and 3 1/2 inches wide across the front from ear to ear. 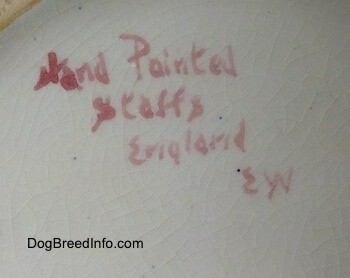 On the bottom it reads Hand Painted Staffs England EW. 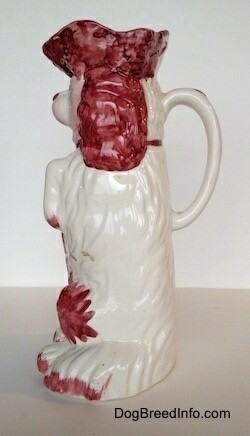 Very nice vintage condition with some crazing. 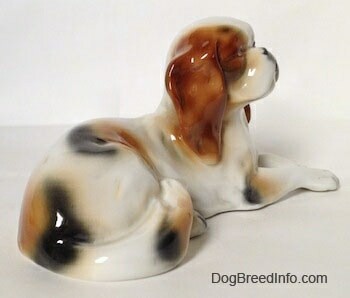 Vintage Cavalier King Charles Spaniel dog porcelain water pitcher—image showing the writing on the bottom of the pitcher that reads Hand Painted Staffs England EW.